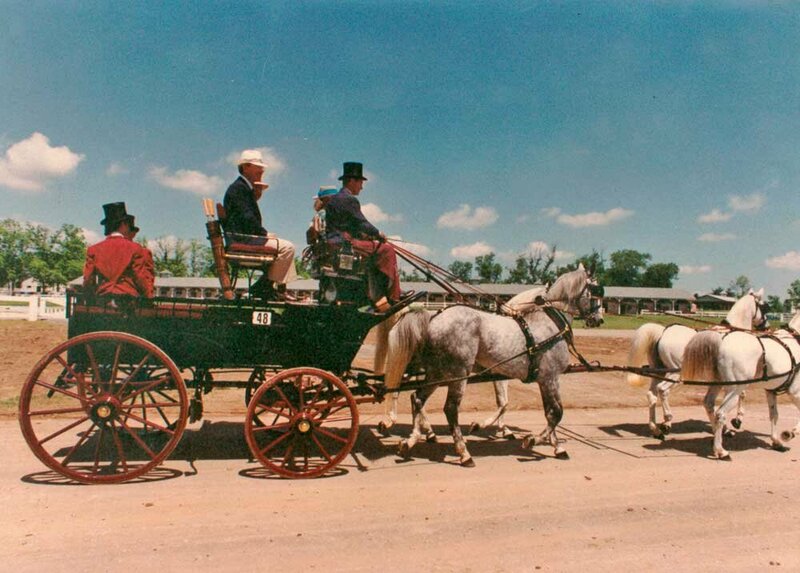 The Wagonnette Break was constructed in 1901 by Brewster and Company of New York, managed by Mr. Henry Brewster, a third generation coach builder. The coach was built to order for Judge William H. Moore and was painted dark maroon, known as “Britton Lake”, and striped in bright red. A Wagonette Break was a vehicle drawn by two, three or four horses and used for outings in the park or in the country or for training horses. The coach is complete with original lamps. Judge Moore was a genuine horse lover and was very much involved in coaching and horse shows. His stables were called “The Rockmarge” at Pride’s Crossing, Massachussetts, and were among the best in the world. Originally, Judge Moore utilized Standardbred trotters because he loved to drive fast-moving horses. He later realized that high-stepping Hackney horses would make the finest heavy harness horse in the show ring. Owning and showing the finest in the world, Judge Moore began the Seaton Hackney Farm near Morristown, New Jersey, which is now a public park. Judge Moore often took his horses and coaches to England to compete in such famous shows as Olympia. This carriage was housed for many years in the collection of the late Evan Shaw, Los Angeles, California, and was purchased by Stewart Morris and Stewart Morris, Jr., in November of 1984 and was restored to its original colors.